Posh debutant Lewis Freestone on the stretch against Fleetwood. Photo: David Lowndes. An experimental Peterborough United side were predictably beaten by promotion-chasing Fleetwood at the ABAX Stadium today (April 15). Craig Mackail-Smith’s goal midway through the second-half proved a consolation strike after the visitors had reached the interval two goals ahead after a dominant first 45 minutes. Posh star Marcus Maddison is knocked over by the Fleetwood defence. Photo; David Lowndes. 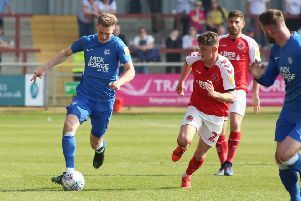 Posh manager Grant McCann’s team selection raised a few eyebrows, not least among Fleetwood’s League One promotion rivals. Seventeen year-olds Lewis Freestone and Andre Borg started as did 20 year-old midfielder Callum Chettle who hadn’t been seen in a Posh first-team shirt since December 31. Monday’s reserve team win over Newport seems to have been an audition for today’s game. Posh were also hit by the withdrawal of centre-back Jack Baldwin, forcing left-back Andrew Hughes to play alongside Michael Bostwick. It always looked a dodgy line-up in which to tackle the third-best team in the division and so it proved in a painful opening 45 minutes. Posh striker Craig Mackail-Smith challenges for a header against the Fleetwood defence. Photo: David Lowndes. Posh did have a couple of bright moments early on, most notably the reverse pass from young, pint-sized midfielder Borg to Mackail-Smith which didn’t receive the finish it deserved. Chettle also tested visiting ‘keeper Alex Cairns from distance before the visitors took control of the contest with their slick passing and impressive movement up front. Former Posh striker David Ball curled just wide before he was instrumental in Fleetwood’s opening goal on 24 minutes. Kyle Dempsey’s pass sent Ball into the Posh penalty area and he drew McGee before passing to Bobby Grant who had the simple task of passing into an empty net. Anthony Grant promptly stopped a Dempsey shot on the goal-line following a corner before McGee blocked Nathan Pond’s shot from the next Fleetwood corner. Bobby Grant sent a free header over the bar, but just as Posh looked like escaping to the dressing room just a goal behind, Fleetwood claimed a second when centre-back Ashley Eastham tapped in from George Glendon’s cross after a short corner caught Posh out. Only the battling qualities of Hughes and Michael Bostwick and the skills of McGee prevented further Fleetwood goals. Fleetwood seemed content to sit on their lead after the break. Posh saw far more of the ball, but struggled to create opportunities. There was a reasonable shout for a penalty just before the hour mark when Mackail-Smith appeared to reach the ball just before visiting ‘keeper Cairns clattered him. But out of the blue Posh pulled a goal back on 68 minutes and it was a cracker. It owed much to Maddison who burst from inside his own half to leave defenders trailing in his wake before sending the perfect cross for Mackail-Smith to nudge over the line from close range. Posh improved against a strangely negative Fleetwood side and almost grabbed an equaliser when Mackail-Smith’s close range header from Michael Smith’s cross was saved a point-blank range by Cairns. In the end the result was just, but Posh can take heart from Freestone’s composed effort after the break. Posh: Luke McGee, Michael Smith, Lewis Freestone, Michael Bostwick, Andrew Hughes, Callum Chettle (sub Junior Morias, 46 mins), Anthony Grant, Leo Da Silva Lopes (sub Chris Forrester, 55 mins), Craig Mackail-Smith, Andrea Borg (sub Paul Taylor, 82 mins), Marcus Maddison. Unused substitutes: Mark Tyler, Brad Inman, Tom Nichols, Jerome Binnom-Williams. Fleetwood: Alex Cairns, Conor McLaughlin, Ashley Eastham, Nathan Pond, Ben Davies, Amari’i Bell, Kyle Dempsey (sub Cameron Brannagan, 78 mins), George Glendon (sub Markus Schwabl, 86 mins), Bobby Grant, Ashley Hunter (sub Wes Burns, 70 mins), David Ball. Unused substitutes: Matt Urwin, Joe Davis, Victor Nirennold, Martyn Woolford. Goals: Posh - Mackail-Smith (68 mins). Fleetwood - Grant (24 mins), Eastham (42 mins). Cautions: Posh - McGee (dissent). Fleetwood - McLaughlin (foul), Eastham (foul).